“In July, Sotheby’s will offer for sale one of the greatest works by J.M.W. Turner still held in private hands. 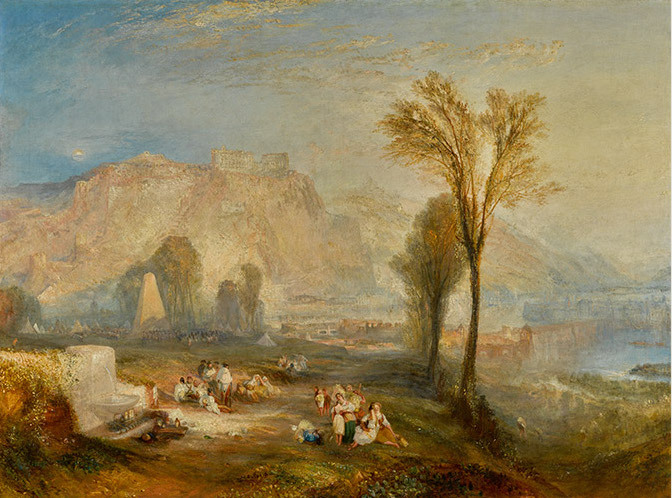 Painted in 1835, ‘Ehrenbreitstein’ dates from a period that is widely considered Turner’s best. Though he made many drawings and watercolours of German views, this painting of the ruined fortress of Ehrenbreitstein, near Coblentz, is thought to be the most important oil painting of a German subject ever painted by the artist. ‘Ehrenbreitstein will be offered as a major highlight of Sotheby’s Old Masters Evening sale on Sotheby’s in London on 5 July.” Announced in preview on Sotheby’s website, the sale of this masterpiece is expected to fetch between £15 to £25 million. Also known as “The Bright Stone of Honour and the Tomb of Marceau, from Byron’s Childe Harold”, this painting is one of only six masterpieces by Turner still kept in private hands. Of these six, it is the most important one reflecting Turner’s admiration for the German landscapes. It was exhibited for the first time of its history at the Royal Academy of Arts, London, the exact same year it was painted, along with four other paintings. These four paintings are now all in important museums, such as the National Gallery of Art, Washington; Metropolitan Museum of Art, New York; Victoria & Albert Museum, London; Cleveland Museum of Art, Ohio. The painting was last time seen at auction in 1965 and achieved £88’000. The freshness of Ehrenbreitstein on the market, its importance for the art of Turner and the fact that it is one of the very few masterpieces of the British artist still in private hands are all criteria for the piece to establish a new record. The current most expensive work by a British painter sold at auction was established in 2014 by “Rome, from Mount Aventine”, another painting by J.M.W. Turner from 1835. It sold for £30.3 million at Sotheby’s London.